German poker sensation Philipp Gruissem managed to secure his second Alpha8 title in row this weekend after an impressive performance in St Kitts. 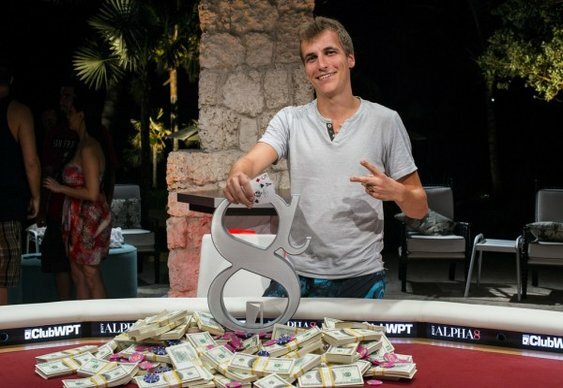 Having recently taken down the £100,000 Alpha8 event in London, Gruissem continued his Super High Roller dominance by outlasting 23 runners in the tour's Caribbean adventure. In total the likes of Isaac Haxton, Fabian Quoss, Scott Seiver and Marvin Rettenmaier helped contribute to the 28 $100,000 entrance fees collected by the tournaments organisers. That prize pool meant five players would walk away from the tournament with some money and as the action developed it was Gruissem who began to dominate. However, while the German built his stack, Timothy Adams found himself falling one place short of the money. With $217,280 slipping from his grasp, Adams could only watch as his Ks Qh was overpowered by Mike McDonald's Ad Kh. With at least some return on their investment locked up, the final five loosened up their raising arms somewhat as they made a bid for the title. Those efforts were in vain though as Gruissem cut through them like a hot knife through butter and, by the one of the finale's McDonald's (Mike) had hit the rail, he was able to put in a decisive display against Tom Macdonald. A brief exchange between the two players eventually culminated in Gruissem catching a slice of luck when his As 5d managed to make a pair against Ad 6c. With Macdonald unable to recover the final pot and $1,086,400 was pushed towards a jubilant Gruissem. Image courtesy of the WPT Blog.